Let's face it, if you love baseball, then sometime in your youth you imagined yourself on a baseball card. It is akin to being a child and dreaming of hitting the game winning grand slam in Game 7 of the World Series. With two out and two strikes, no less. I even suspect that most professional baseball players like to see themselves framed on a 2.5 by 3.5 piece of cardboard. However, imagine your surprise when you do see yourself on a card, and it is nothing like you hoped. You're not making a spectacular diving play in the field. You're not taking a wicked cut at the dish. You're not even holding your bat on your shoulder and gazing into the distance, as the palm trees and stanchions sway in the springtime Florida background. Ouch. 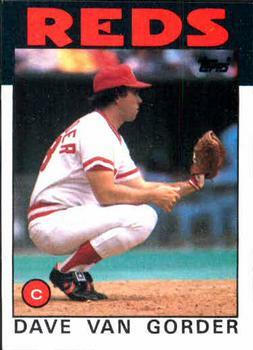 Dave Van Gorder was one of four, that's right, four catchers on the 1985 Cincinnati Reds squad. To be immortalized on cardboard warming up a pitcher between innings, while the starter gets his gear on is just disrespectful to me. Making it to the major leagues is a great athletic accomplishment, and even if you are a backup, your card shouldn't scream pine rider. Ouch is right. Designated warmup catcher is not a position most fans appreciate. Lol... great post. Did Topps actually produce cards for all four catchers? That would be pretty cool. Anyways, I always imagined myself immortalized on cardboard leading off of first... slouched down... fingers dangling... getting ready to steal second.